The basis for diamond knowledge are the "4C's." We add a 5th "C."
Although the majority of gem diamonds appearto be colorless, others can contain increasing tinges of yellow or brown, some of which are reffered to as champagne diamonds. It is a totally colorless diamond that allows white light to pass effortlessly and be dispersed as rainbows of color. Rare stones of exceptional color - green, red, blue, pink, or amber - are known as "Fancies." Almost all diamonds contain minute traces of non-crystalized carbon or small non-diamond crystals. Most are not discernable to the naked eye and require magnification to become visable. Called "inclusions," they are nature's fingerprint and make every diamond unique. Minute inclusions will niether mar nor endanger its beauty; however, the fewer they are, the rarer the stone will be. Of all the 4C's cut is the one most directly influenced by man. The other three are dictated by nature. 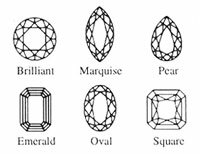 Diamonds are cut into a number of shapes, depending on the nature of the rough stone. The cut or make of a diamond will dramatically influence its fire and sparkle, for it is the cutter's skilll that releases its beauty. As with all precious stones, the weight - and therefore the size - of a diamond is expressed in carats. The carat originated as a natural unit of weight: the seeds of a carob tree. Diamonds were traditionally weighed against these seeds. However, the system was later standardized and one carat was fixed at 200 milligrams (1/5 of a gram). One carat is divided into 100 "points" so that a diamond of 25 points is described as a quarter of a carat or 0.25 carats. 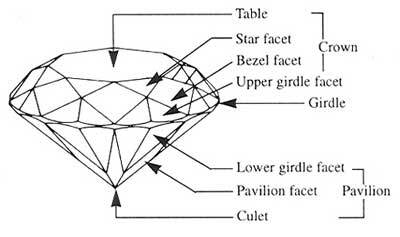 Size is the most obvious factor in determining the value of a diamond, but two dimonds of equal size can have unequal prices, depending on their quality. And diamonds of high quality can be found in all size ranges. As the old adage goes, "if it looks too good to be true, it probably is." Don't be fooled by bargain websites. Diamond values are monitored, controlled, and guided by a system not unlike the stock market. Be wary of "bargain" diamonds, and most important, INSIST on a lab report from a major gemological laboratory, such as the Gemological Institute of America, which is the supreme court of the diamond world, or the European Gemological Lab. These two are the only labs we use. Both are well known world-wide and well respected.